o0o0o0o0o0o.. I would love to do that! Everything in my truck is blue besides the dang gages!!! Where did you get the white faces and the blue needles at? I bought them from stylintrucks.com(click on Daytona gauge faces), but they're made by US Speedo. You can find them at lots of online sites or direct from US Speedo. They have several colors/variants to choose from. The new Aqua stuff looks wicked, I just don't have $250 to drop on it right now. Last edited by fireman137; 06-11-2008 at 12:34 AM. Looks good. And taking off the green paint on the back isnt very hard. I just used a razor blade when i took the coating off of mine. 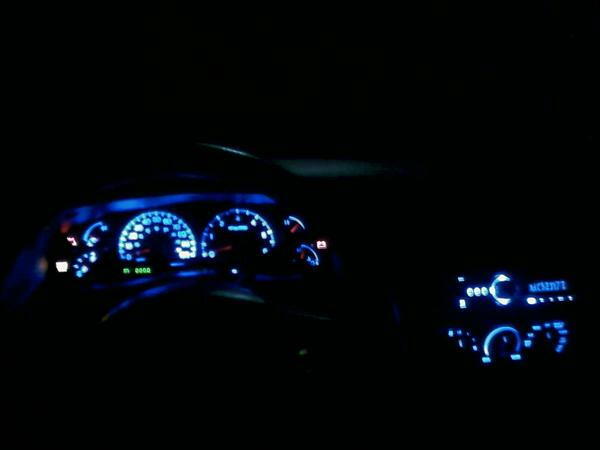 But now everything in my truck is blue except the cluster. do you know if the lights behind the ic in the 07's sre bulbs also or are they led's? I haven't heard anyone say they're different, so I assume they're still incandescent bulbs. In fact, I haven't heard of hardly any manufacturers using LEDs anywhere in their production models. There were 11 bulbs in total: 6 do the general backlighting, one for the odometer lcd, and 4 indicator lights (left and right turn, hi beam, and cruise control). They were all #74 bulbs. Looks awesome. Do you hire out? thanx man, i'm gonna show this pic to my friend (ford tech) and find out the name of the tool and i'll post it. A plastic fork or spork also seems to work well. im getting ready to change out the bulbs behind my instrument cluster. i am removing the green film this weekend. i'm wondering-i have an 07 mark lt. how do i find out how many bulbs and what type i need to order? any help would be appreciated.